Today advertisers use futuristic tech like jetpacks and robots in their TV ads so that potential consumers think of their brand as forward thinking and innovative. In the 1920s, the cutting edge gadget that advertisers most wanted to associate themselves with was television. But, since the technology was still in its infancy, they faked it. 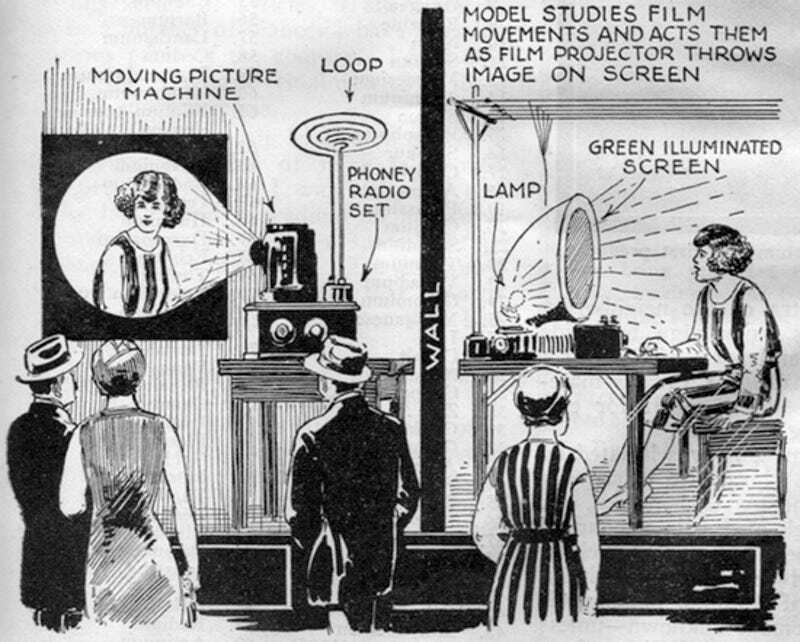 The August 1926 issue of Science and Invention magazine included two illustrations showing ways that businesses could create “fake” television demonstrations to lure customers inside their stores. The illustration above depicts a bogus TV demo in a store window, divided by a wall. On the left side of the window display, people saw what was meant to look like a TV projector being sent a wireless signal by a woman sitting in the right side of the display. Instead the projection was just a movie made earlier with the same actress, who did her best to mimic the pre-recorded actions. Another method of creating fake TV broadcasts was to use a series of mirrors. In the illustration below, unneeded wires give the impression that the TV signal is being sent between the two rooms. In reality, mirrors have been strategically set up so that the actress’s image appears on the fake TV set in the next room. Businesses that couldn’t stage fake TV demonstrations still used television as a theme in their advertisements. The illustration below hung at Martin’s Lunch Room at 15 Wall Street in Norwalk, Connecticut around 1929. The poster’s message was that even though technology is developing at a rapid pace, you can still find great customer service with a human touch at their restaurant. As we’ve looked at many times before, the idea of TV being a purely broadcast medium (rather than a point-to-point service which today we might call videophone) wasn’t yet a certainty until the late 1940s. In fact, TV had many false starts before it would become a practical reality in American homes after World War II. But fittingly enough, it would be TV itself — along with the dwindling influence of the downtown department store — that would cause advertisers to abandon storefronts, opting instead to promote their wares via commercials. Of course, what was promised in those commercials wasn’t always genuine... but that’s a story for another time.